For the fifth consecutive year, international student numbers have grown in Japan. The latest statistics from the Japan Student Services Organization (JASSO) indicate that as of May 2017, 267,040 foreign students were studying in Japan, an increase of 11.6% over 2016. 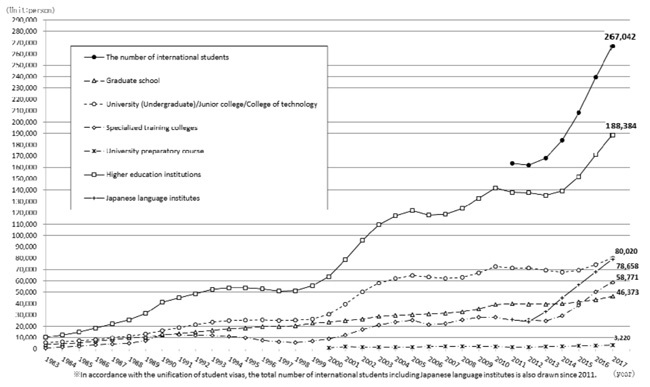 As the following chart reflects, the majority of visiting students (188,385) were studying in higher education institutions – a 10% increase over 2016 – with 78,660 in language courses (up 15.5% over 2016). Of those international students in higher education, the majority were in undergraduate programmes (80,020), while 58,770 were in specialised training programmes and 46,370 were in graduate studies. Cumulatively, from 2013 through 2017, the growth rate of international students in Japan is just under 60%, which averages out to roughly 12% per year. At this rate, Japan is well on its way to achieving its long-standing goal of hosting 300,000 students by 2020, and may in fact reach that target by late 2018 or early 2019 assuming the growth trend continues. The number of Chinese students in 2017 was 107,260 (up 8.9% over 2016); Vietnamese students numbered 61,670 (up 14.6%). Also contributing large numbers of students are Nepal (21,500, up 10.4%) and South Korea, though the increase in South Korean students since 2016 is modest: 1.8%. Taiwanese students increased to 8,950, a rise of 7.7%, but the most notable growth stemmed from Sri Lanka: the roughly 6,610 Sri Lankan students now studying in Japan represent a 66.7% increase over 2016. Rounding out the top ten sending counties are Indonesia (5,495, up 18.7%), Myanmar (4,820, up 25.1%), Thailand (3,990, up 3.7%), and Malaysia (2,950, up 7.7%). The number of Chinese students in Japanese undergraduate programmes far exceeds that of Vietnamese students (79,500 compared to 35,490, respectively). But when it comes to Japanese language programmes, there is a virtual balance of Chinese and Vietnamese: 27,760 versus 26,180, respectively. Other nationalities that are interested in Japanese language programmes include those from the top ten sending markets, but also Filipinos (890, up from 550 the previous year) and Bangladeshis (830, up from 580 the previous year). Along with its goal to reach 300,000 foreign students by 2020, the government also has a target of raising the employment rate for its international graduates to 50% by 2020. The Japanese economy has been on a steady upswing, with GDP rising by 2.5% in the July–September 2017 quarter, the seventh consecutive quarter of growth and, according to Nippon.com, “Japan’s longest quarterly growth streak since the government began compiling comparable statistics in 1994.” There is speculation that renewed confidence among investors and small and medium businesses combined with the demand for skilled workers to fill jobs will raise wages. If so, it will be yet another reason for students from within the Asian region to consider Japan as a study destination. As of 2017, Japan has six universities in the Times Higher Education Top 100 World University Rankings, and 12 Japanese higher education institutions are in the Top 100 Asian University Rankings (placing it between China, which leads with 24 in the Top 100 Asian rankings, and Taiwan, with nine). These rankings are consistent with a strategy launched in 2014 by the government to internationalise 37 of its more than 700 universities: the Top Global Universities Initiative. The initiative’s goal is to increase Japan’s global competitiveness and collaboration with other leading economies, and its funding carries through to 2024. Of the 37 universities chosen for the overall scheme, 11 national universities and two private universities were designated as “Type A institutions” whose funding relates directly to their rising up in world university rankings. As of 2017, 10 national universities had made the Times Higher Education Top 100 Asian University rankings, with the 11th almost there (placing 101st). Suffice it to say, if Japan achieves its goal of 300,000 international students by – or even before – 2020, it will be no accident, but rather the result of a highly integrated strategy that promises both academic and employment benefits for its international graduates. This entry was posted in Asia, Higher Education, Japan, Language Learning, Most Popular, Regions and tagged student recruitment, student enrolment, foreign language learning, postgraduate student recruitment, international students in Japan.